Realize that I haven't update my portfolio for a while so here are the updates. I sold them in July at $0.715 after realizing that it doesn't really fit into my plans aka the yield. Moreover, I also need the money for family cashflow due to renovation of my new house. Well, maybe I should have sold it at a higher price because there is a chance but to me, it's ok.
With the money and using my margin facility, I purchase another 20,000 shares of Sabana REIT at $0.515, increasing my holdings to 41,000 shares. They give a high yield and is trading at a deep discount to NAV. Thus, I thought it is a good time to enter the market. I am glad that I did because they have not dropped further and I have received two rounds of dividend at around 9% yield. So I am good. I just sold my HDB flat and have gotten a sum of cash from the proceeds. Thus, I have used the money to pay off my margin loan. No more 6% loan as of now. But I did took up a renovation loan at 4.38% for my new house which was suppose to be paid using my investment cash. Thus, it will feature in my portfolio. 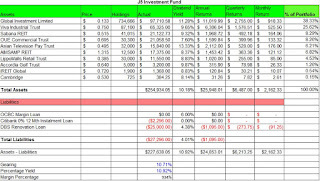 Thus with these portfolio, here are the statistics. 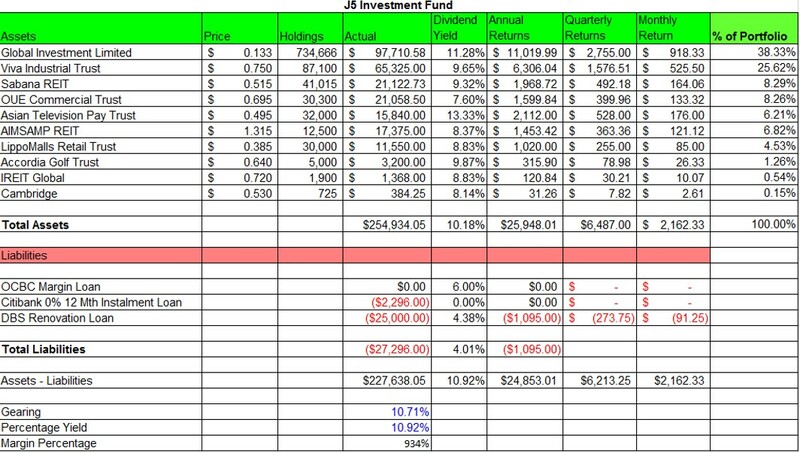 With this portfolio, it is generating an average of $2,282 per month which is great for me. Enjoying the extra passive income. You really should think about diversification: 38% in one stock is very concentrated. I never go beyond 10%. Also, in times like these, investors dump the high yield stuff and go for the safer assets. So choosing REITS that are rated BBB- and above, you're more likely to weather the storm (that is coming and has already started). Another thing is yield. Absolute makes little sense (8%). Instead you should consider the REIT as a debt instrument (effectively it's a sort of perpetual bond, as they constantly need to refinance, and the property prices themselves evolve inversly with interest rated). So it makes more sense to think of the yield as a spread above long term risk free rate (say 10y SGD government bond). Sure REITs go down and their yield goes up. But if the yield goes up 50bp when the SGD 10y rate went up 100bp, that's not a great bargain. Quality content is the key to invite the users to go to see the site, that’s what this website is providing. This piece of writing is really fruitful for me, keep up posting these articles or reviews. #1 Healthcare Website Design & Marketing Services for Physicians. Just want to thank you for the kindly sharing about all of the information in this blog. This is the most important website I have to visit almost everyday.